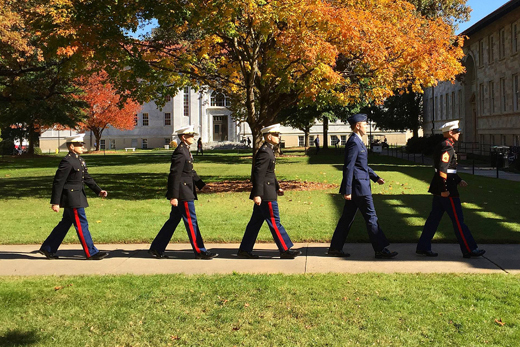 Emory holds its annual Veterans Day ceremony at 10:55 a.m. Nov. 11 on the Quad. The university is committed to supporting veterans as students and in the community. As the nation observes Veterans Day on Nov. 11, Emory Law's student-run Volunteer Clinic for Veterans is succeeding in its goal to provide free legal assistance to Georgia veterans and their families. The clinic was founded in 2013 by students Martin Bunt 14L, Rachel Erdman 14L, Emory Law professor Charles Shanor and Lane Dennard. Since then, the clinic has handled 119 cases, which have resulted in $2.5 million in benefits awarded to its clients. So far, 79 Emory Law students and 51 lawyers have volunteered. Some of their victories have been life changing. The Veterans Benefits Administration denied pension benefits for the widow of an Iraq War combat veteran with four minor children. On appeal the clinic argued she was entitled to a pension because her husband's service-connected disability was a significant contributing cause in his death. They prevailed, and she was granted $2,638 per month. Her children were granted G.I. Bill educational benefits and health care. The serviceman's widow was also awarded $26,000 in back pay. Another client was a U.S. Army veteran with traumatic brain injury and related disabilities, which were the result of an accident that happened during her service. The ambulance she was driving crashed and overturned. Although she was originally rated at 70 percent disability by the VA, in October 2013 she was notified that her disability rating would be reduced to zero. The clinic appealed, and the result was a 100-percent disability rating, with monthly payments of more than $3,000. She was also granted $76,000 in back pay. The ruling was especially significant because the veteran had lost her home due to her inability to work. The VA award will allow her to purchase a home, the clinic directors say. "The pursuit of a claim before the VA can be a slow-moving and detailed process," says Shanor, the clinic's co-director. "In cases with complicated facts or legal issues, veterans may be more likely to succeed when they have legal representation. I am extremely proud of the work done by the clinic's students and volunteers." The clinic received the 2014 Law School Excellence in Access to Justice Group Award from the State Bar of Georgia Access to Justice Committee. AmeriCorps has supported the clinic by providing funds for two Equal Justice Works Fellows. The clinic also received the 2014 Emory University Most Outstanding Service Volunteer organization award. Shanor is the clinic's co-founder and co-director. He is a veteran, a Rhodes Scholar and a graduate of the University of Virginia Law School. He is an expert in employment discrimination, constitutional law, national security and counter-terrorism law. Drew Early is the clinic's co-director. He is a West Point graduate and a retired U.S. Army Lt. Colonel. He is an expert on VA disability law and teaches a class on this subject each fall at Emory Law as an adjunct professor. Dennard is the clinic's co-founder and director emeritus. He commanded an infantry company in Vietnam in 1969 and was awarded the Silver Star. He received the 2015 Emory Public Interest Committee (EPIC) Inspiration Award for his work with the clinic. Emory holds its annual Veterans Day ceremony at 10:55 a.m. Nov. 11 on the Quad, and the university is committed to supporting veterans as students and in the community. In the 2014-2015 academic year, Emory invested over $1 million dollars in financial aid to students who are veterans through the Yellow Ribbon Program, which allows degree-granting institutions of higher learning in the U.S. to voluntarily enter into an agreement with the VA to fund tuition expenses that exceed the annual VA tuition and fees benefit. All of Emory's nine schools have chosen to participate. Meanwhile, Emory Healthcare's Veterans Program offers post-9/11 veterans and their family members a variety of support resources focused on helping people in the southeastern United States get help for post-traumatic stress disorder, traumatic brain injury, military sexual trauma, anxiety and depression. The program is comprised of several initiatives committed to the health and wellbeing of veterans, including the newly established Warrior Care Network. This national network is a collaboration of the Wounded Warrior Project and four academic medical centers, including Emory, offering quality mental health care for post-9/11 veterans, at no cost to qualified individuals. Find out more about support for veterans at Emory, including training for health care providers, additional services, and partnering with the U.S. Department of Veterans Affairs.